Teeth whitening is an easy and affordable method of improving the appearance and beauty of your smile. You have in-office professional treatments and take home trays as options. Zoom! Whitening can be completed in one hour at our Boston office and is performed using highly concentrated gels in an office setting. Take-home trays offer the same results over an extended timeframe that can be days or weeks. The teeth whitening procedure begins with a custom mold of the mouth and a professional whitening gel will be provided to take home. The take-home gel will be applied to your teeth and left for a period of time. Both the in-office and take-home method offer the same results, although we recommend visiting our office to ensure which method can work the best for you. The results of teeth whitening can be supplemented with high quality oral hygiene, regular exams, and cleanings. You must brush and floss consistently while maintaining a healthy diet. 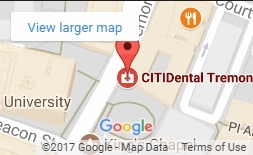 You can find more information about how to enhance your teeth whitening results in Boston by calling and scheduling an appointment at CITIDental Tremont.